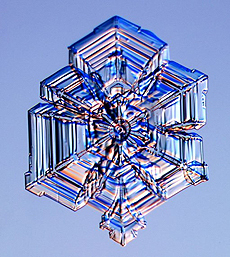 At its smallest scale, nature is highly symmetric. 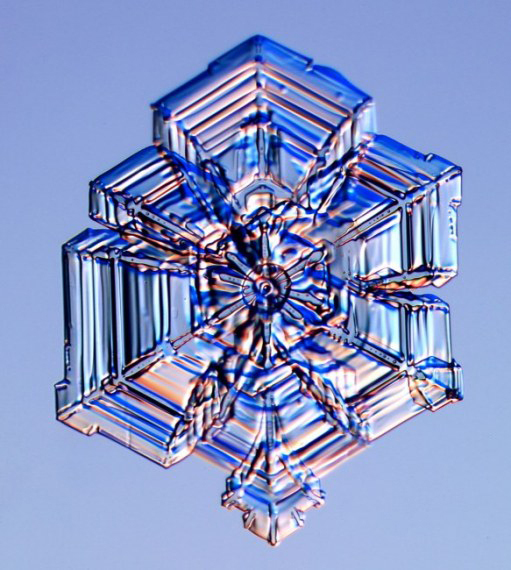 There are many different kinds of symmetries among particles — for instance, matter and antimatter are identical except for charge, like an image in a mirror that is the same as its object, but reversed. There are three generations of each type of matter (and antimatter) that are identical but for mass: small, medium and large. Photons of the electromagnetic force and Z bosons of the weak force also differ only in mass. One could say that particle physics is really the study of nature’s symmetries. It should be no surprise, then, that physicists are seeking new symmetries to understand the universe at a deeper level. Supersymmetry is a hypothetical symmetry between matter and forces— if correct, matter and forces would be two sides of the same coin. The list of reasons that supersymmetry is attractive is a long one. In particular, it could explain why the Higgs boson is light enough to be observed at the Large Hadron Collider (LHC), which seems no longer to be a purely theoretical issue. Exact supersymmetry would be very simple: Each particle of matter would have a corresponding particle of force with the same mass, such as quarks and “squarks” (supersymmetric quarks). However, no such thing has been observed. If it exists, supersymmetry must be inexact— quarks and squarks would have different masses, much like the inexact symmetry between massless photons and massive Z bosons. Supersymmetry’s attractiveness is undimmed by this imperfection, however. In fact, broken supersymmetry could explain how our complex world unifies at exceedingly high energies, where the little mass differences between quarks and squarks disappear. But like a shattered mirror, broken supersymmetry is a messy business. There are over a hundred free parameters— knobs to turn— when describing the way that supersymmetry might be inexact. Each of them predicts different particles and different decay patterns. Searches for broken supersymmetry, whether at the LHC, in high-intensity experiments or in space, must be very general or have limited applicability. The above is a plot of two cMSSM parameters; the other three are held fixed. 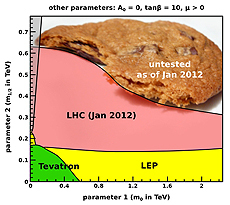 Each experiment (LEP, Tevatron, LHC) eliminates some combinations of parameter values when it looks for but does not find evidence of supersymmetry. To control the chaos, physicists often focus their attention on simple models, in which many of the free parameters are chosen to be equal to each other. The simplest is known as the constrained Minimally Supersymmetric Standard Model, or cMSSM. In this model, there are only five free parameters. When physicists seek supersymmetry, they often cast an eye toward the cMSSM for guidance. At the very least, it provides a concrete way to track progress. 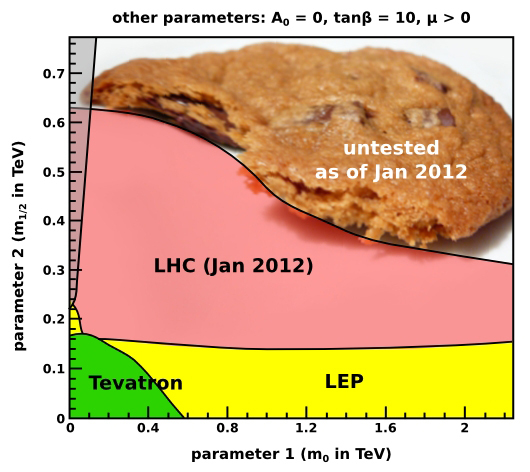 Each new experiment rules out new combinations of the cMSSM parameter values, which can be drawn on a plot like bites taken out of a cookie. For 30 years, increasingly sensitive experiments have eaten away at the possibilities, shown in Figure 2. So far, the LHC has done the most damage: If the mass of cMSSM squarks were small enough to be within the LHC’s energy range, it would have produced them by now. As new data push the boundary further, the possible parameter combinations that remain aren’t attractive. It may be that we live in a cMSSM world with squark masses that are just outside of reach, but that would make the idea of supersymmetry less relevant— it would no longer solve the problems that motivated it in the first place, such as explaining why the mass of the Higgs boson is so low. Deciding when to pronounce the model dead is subjective, but there is a great deal of discussion about it, and the prognosis is not good. What if the cMSSM is truly and finally ruled out? That would be a major milestone, a disappointment perhaps, but the broader subject of supersymmetry would not be closed. Physicists are already rolling up their sleeves and considering more general models of supersymmetry breaking, as well as alternatives to supersymmetry that solve some of the same problems. However this turns out, the picture is not as simple as it might have been.